Penhaligon’s new Juniper Sling was “inspired by London Dry Gin and the gin-drinking Bright Young Things of the 1920s.” Nancy Mitford, Cecil Beaton and Evelyn Waugh were B.Y.T. in England, and let’s throw in some Americans, too: Louise Brooks, F. Scott Fitzgerald, and Louis Armstrong will do. How far we’ve dimmed — “our” bright young things include the Kardashian sisters, Justin Bieber, Prince Harry and Pippa (not to mention hoards of reality TV cringe-inducers). Much less depressing to talk about perfume! After its energetic opening, Juniper Sling conks out. Juniper Sling’s base promises a mix of brown sugar, black cherry and amber — what a wonderful finish that could have been — but I detect only a second or two of cherry liqueur and some thin, slightly mentholated vetiver (mixed with anise?) 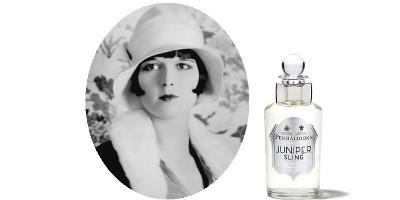 Juniper Sling seems a perfume made to fill a pretty, retro bottle and to flesh out a vague idea of an interesting time and place: the Roaring Twenties in London. Unlike a “percolating,” tasty cocktail that leaves one “buzzing,” Juniper Sling goes down quick and produces no lingering high; it wears like a cologne (it has mediocre lasting power and sillage). Juniper Sling Eau de Toilette is a simple, “refresher” scent, and at $110 for 50 ml or $140 for 100 ml it’s way overpriced. *Developed by perfumer Olivier Cresp; Juniper Sling lists fragrance notes of cinnamon, orange brandy, angelica, juniper berry, cardamom, leather, black pepper, orris, brown sugar, black cherry, vetiver and ambrox. Watch the Juniper Sling video here. Note: top image of Louise Brooks via Wikimedia Commons. This review made me sad to know that JS isn’t all I’d dreamed it would be, but thank you for the honesty, Kevin, and saving me the money, too. I still *love* that video, and not that I’ve ever seen them there, but if it ever hits the discounters, it sounds perfect for hot summer afternoons and evenings. Oh, and agreed on the new crop of young and famous types. I’m the old Hollywood nerd among our friends, and do the explaining when watching Boardwalk Empire since they had no clue even who Mary Pickford, Eddie Cantor or Clara Bow were when a reference or character (in Eddie’s case) came along. I’d been hoping to make JS my “Boardwalk Empire fragrance”, but will probably be sticking with Narcisse Noir or Habanita for now. i liked it initially but as you say its longevity & sillage are very poor on me & it very quickly dies away with a whimper. is it mainly because its only an EDT concentration?? And at that price for an EDT its WAY overpriced! NT: the bane of this year’s men’s releases especially: the feeble base notes. All of Penhaligon’s creations die out quickly on me. I love the scents, especially Artemisia, but it’s far too expensive for how long it lasts on the skin. I find I reapply the scent constantly and no one seems to be able to smell it on my after 2-3 hours. None of them have any staying power. I wonder why that is? I have luck with many of them…Hammam Bouquet lasts forever on me, as does Elixir…even their citruses last longer on me than this one does. Penhaligon’s offerings tend to just die on me, as well. I only own Artemisia because I loved the bottle too much not to buy it, but it really doesn’t last. I can douse myself in the stuff and it fades within a few hours. Tragic really, because this sounds like this could have been lovely. Klytaemnestra: this would be great as a soap. I don’t know the Penhaligons well, but I have no longevity problems at all with Amaranthine, that’s an all day long one on me, so maybe I could go lucky here too? I love the video, and my G&Ts, so I really am positively biased..
Bee: Agree…quite a few of them last and last on me. I get a strong blast at the opening of Amaranthine which eases off over a period of half an hour to an hour, after which it sits very close to the skin. By lunch time it has generally disappeared. Love it tho’! Yeah I have a smaple on me, similar cologne type longevity. But I have heard that it is difficult to make a gin scent that lasts a long time. In any case I get about 4 hours on this. Don’t agree with the comment on the bright young things of today. Those people are clearly not them. I’m sure the 1920s had society girls and pretty-boy singers also, who have been forgotten. It is a shame that truly bright people get constantly drowned out by vapid self-promoters, but for someone’s name to last after their death they need something to back it up with. Morgan: whenever I drink gin I dab some on…and certainly Juniper Sling lasts longer than actual gin. Ha! No matter how you try to make it last…I’ve been on a kick lately. Bombay, rosewater and bitter lime. No…no it doesn’t last long. Well, it’s a disappointment, Kevin, but thanks for letting us know. And Morgan’s point is well taken: every era must have had its worthless or pointless celebrities who are now deservedly forgotten. GG: I can’t imagine any era in history with more fools readily available for “consumption” than our era. Blame it on TV. I do think you are romanticizing the past, Kevin. Some of those bright young things were terrible people, like two of Nancy Mitford’s sisters (Unity and Diana), who were Anti-Semitic Fascists. The amazing Jessica Mitford (the fourth sister) rejected all those “bright young things” and became a radical and infamous muckraker! Really? Wow. As awful as Makeda is, I think I’d have an even tougher time being a halfway decent person if I had to deal with being named Unity. Penhaligon’s references the past all the time by preserving its Victorian-era bottes and boxes, sometimes even for perfumes made in a much later era. …but the good thing is the “Bright Young Things” of Waugh’s “Vile Bodies” weren’t the actual ones — that was Waugh and crew (the mags and papers of the day missed the irony, when lifting the phrase to throw it across their “shocking tales of scandal and debauchery”). The title of the book was tongue-in-cheek satire of the spoiled and privileged, as observed by the bohemian intellectual set (a little exercise in intellecto-snobbishness, of course, but social interaction is a dynamic thing and everyone believes they have all the answers and the torch of legitimacy ) and wasn’t said in reverence. It was a good call to pick Louise Brooks for this review, as gin was her drink (trivia: She wore a scent from Jean Patou, as he dressed her; it was probably the one for brunettes, from his haircolor themed line in the late 20’s). Oh, too bad — I was looking forward to this one! It is awfully pricy for such wimpy lasting power. Still might sample it, though. You know, an excellent interpretation of “Flapper” scents is found in the Crazy Libellule & The Poppies brand, the “Garconnes” line. There’s a smoky tiare, a nice, weedy vetiver and the one inspired by Brooks, “Chere Louise”, is a nice, smoky rose (with just a tad of sweaty saffron); it really does have the heft of an early Patou scent. And the whole line is so cheap. Well, I suppose I’m in the minority here. I’ve been looking for for something that wears close to the skin, appropriate for sport, but not of the generic soapy, powdery, ‘clean’ sport-scents that seem so prevalent lately. When one wants to enjoy fragrance, but not smell ‘perfumed’. So far, this has fit the bill. I agree the lasting power is not great, and I will likely soon experiment with layering. FWIW, I gave the sample from the SA to a non-perfumista friend — she absolutely ADORES this, and is considering this for her first serious fragrance purchase. I have 20 Penhaligon’s fragrances and they are probably my favourite house. The only two I don’t like are English Fern and this one. This is the most disappointing release in years. The top and heart notes of this are fantastic. But really, at this price point this should be an EDP – particularly given its mayfly like longevity. Two hours max then it disappears. The packaging is spectacular though – which is sad that that is something of note, when it should be the fragrance which draws the headlines. This, in my opinion is very much a triumph of style over substance.